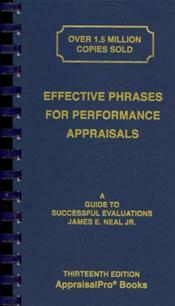 by Neal, James E. Jr.
For over thirty five years, this widely acclaimed publication has set the standard for appraising employee performance. Now in its twelfth edition, the book derives its success from years of extensive research. It has been continuously revised to meet changing employment conditions. This powerful and time proven guide contains more than 3,500 professionally written phrases for describing the key performance factors found on most evaluation forms. With this practical guide, you can accurately and quickly complete the "comments," "examples," and "overall appraisal" sections. The book has attracted global users and is popular in the fields of business, education, government, law enforcement, medicine and the military.